In principle, an oil boiler works in the same way as a gas boiler, in that it uses fuel to create hot water. This hot water is then distributed to the radiators around the house and is used to create warmth. The same hot water is also supplied to the taps in the house. The key difference between oil and gas boilers though, is the fuel used. Rather than being connected to a gas supply, an oil boiler is connected to a tank, where oil is stored until it is needed. Unlike conventional oil boilers, Viessmann’s oil condensing boilers come prepared for the future and reduce the reliance on fossil fuels. Instead, they are designed to be used with fuel oil mixed with bio-oil, which means they can be partially run on renewables. Yes, whilst filling your oil tank it is always recommended that you turn off your boiler. It is also recommended that you ensure your boiler remains switched off for 30 minutes afterwards. The reason for this is to ensure any sediment from the base of the tank is not drawn into the fuel line. How are oil boilers rated? Oil boilers are now rated using the ErP Directive, with their performance ratings shown on energy efficiency labels just like all other heating products. For heat generators, the best efficiency class is designated with A++ and the worst with G.
How efficient are oil boilers? 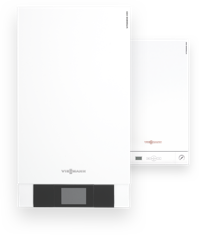 Viessmann’s oil boilers feature an unbeaten high efficiency of 98 percent, to ensure you are making an active contribution towards using resources efficiently and saving energy. We have specifically developed our boiler systems to feature a low level of operating noise. However, boiler noise levels will always vary depending on the location within your property and any other background noise. Do I need to install an oil condensing boiler? In England, Wales, Scotland and Northern Ireland, boilers need to be condensing unless your installer requests formal exemption from OFTEC. How can the condensate be drained in an oil condensing boiler? When replacing my oil boiler, do I also need to replace my oil storage tank? We would definitely recommend it. When you replace your oil boiler, you are not legally required to change your oil storage tank, unless installing the boiler makes the oil tank non-compliant. However, if an incident occurs and your oil storage tank does not comply with the current legislation, you could have trouble making an insurance claim. A lockout in the burner of your oil boiler could either be caused by a leak in the pipeline, because there is no oil or because the oil is contaminated. Contamination can occur for a number of reasons, these include - a damaged tank from condensation, sludge, water ingress or corrosion of the tank. Is an external air break required when a condensate pipe is terminated into a rainwater downpipe? Yes, if using your rainwater downpipe as a termination point for your condensate pipe, it is important that an air brake is installed between the boiler’s condensate outlet and the drain pipe connection. This must be external to your property, in order to avoid flooding during adverse weather conditions.